There’s a saying: “You can have it all…just not all at the same time.” Well, when it comes to my apartment, that definitely applies. The moment I walked into my apartment, I was in love and knew I wanted it. Everything was so shiny and brand new and exactly the pick me up I needed after weeks of looking at nightmare after nightmare. 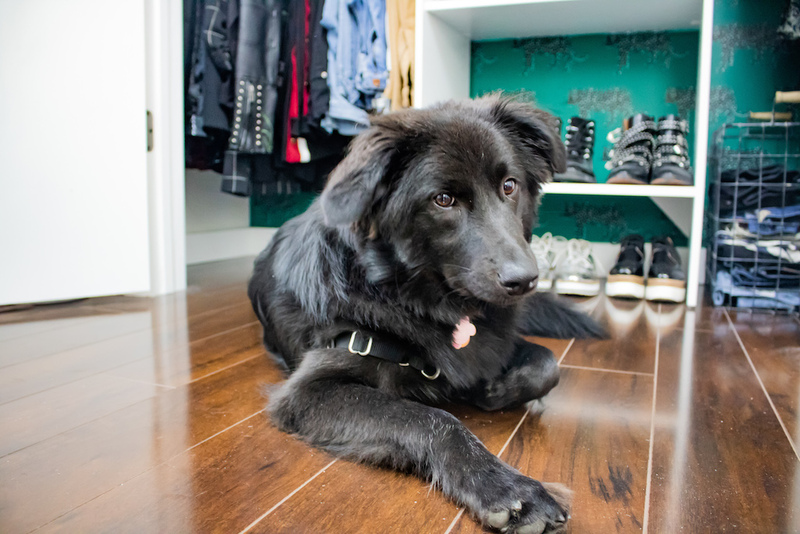 But if there’s one thing I didn’t like, it was the closet—and general lack of storage space. Not only is there minimal storage space, but when I opened the closet the day I viewed the apartment, my first thought was, “Whose hair-brained idea was this?” Seriously. 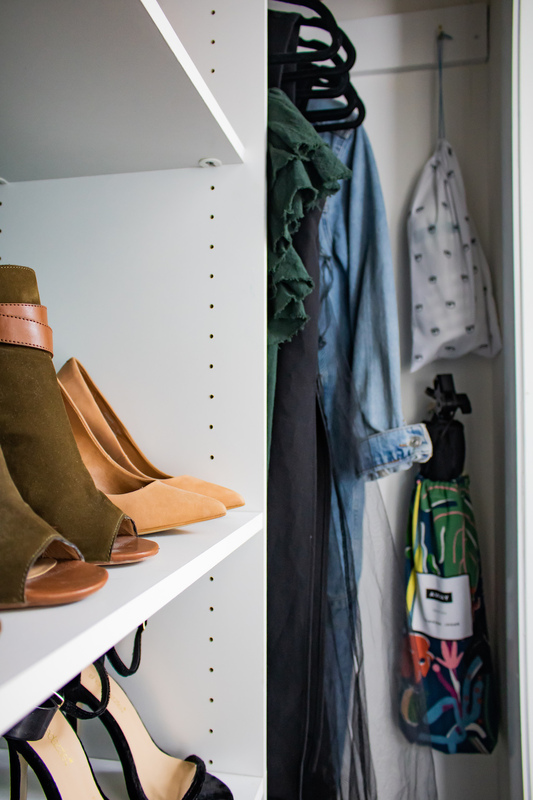 Who makes a closet without any kind of hardware? Not even so much as a rod to hang clothing on. What was I supposed to do? Stack my clothing in boxes on the floor?? Ridiculous. But for kicks and giggles, have a look at the before. 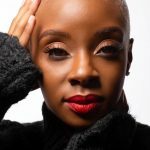 *face palm* A far cry from the #bloggergoals we’re all so used to seeing on Instagram. But like I said, you can’t always have it all. So, I told myself I would just find a way to make it work, because I loved everything else! I knew I would eventually build it out a bit, but for a short term solution, I had my property manager come install a rod. (I added the makeshift shelf later #desperatetimescallfordesperatemeasures.) I’m not sure if it made it better or worse aesthetically. But at least, I was able to unpack my clothing and have some sort of storage. Blah, right? And totally useless! 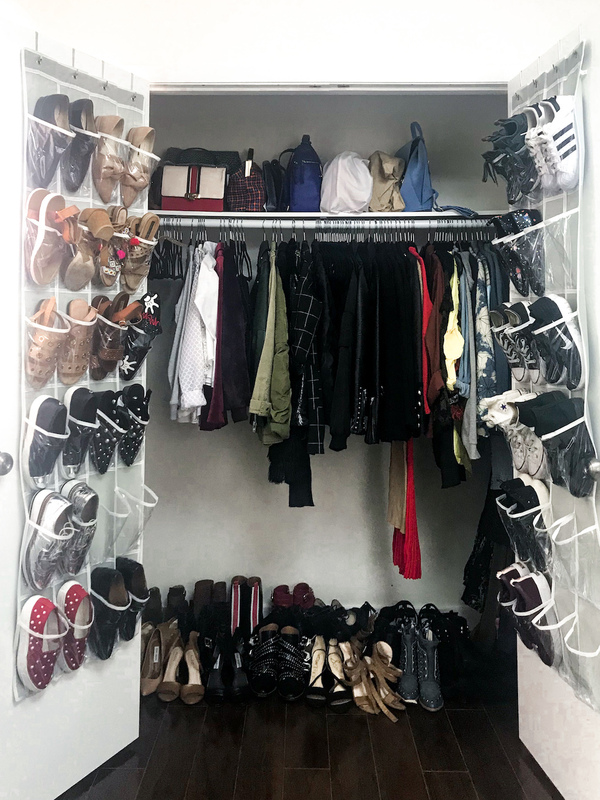 I was constantly running out of places to put things—especially when my big winter coats were hanging—and no matter how hard I tried, nothing ever felt organized. 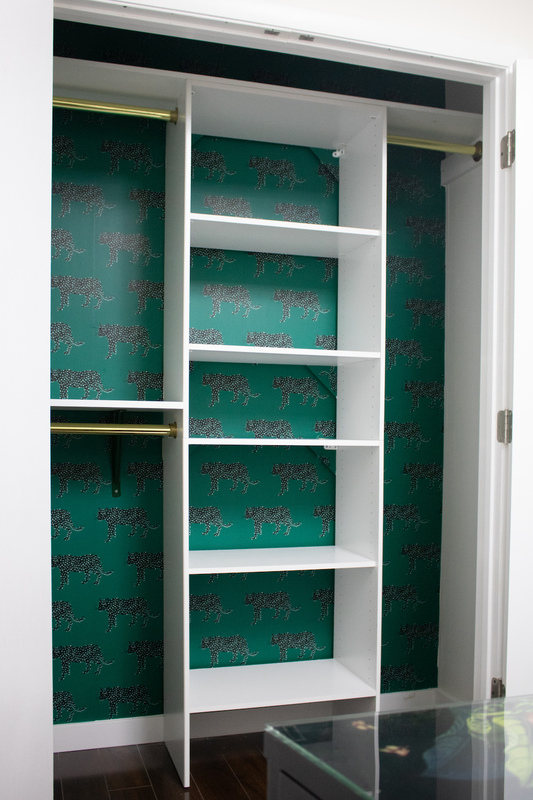 Enter a wonderful and inexpensive ClosetMaid shelving unit from Home Depot! I had a friend come over and help me put it together. It was a really quick and easy process that took us entiiiiiirely too long. Lol. There’s brick behind several of the walls in my apartment and drilling into them takes a lot of strength and prayer. So we spent a lot time just trying to drill into the walls. But actually putting it together took no time at all. Note: I installed the shelving unit first, but it would have been much smarter to wallpaper first. However, the truth is: 1) the clutter got the best of me and I was desperate for more storage and 2) I initially planned to leave everything all white, but once the unit was installed, I realized the space still didn’t reflect me or my decor style. It was at that point that I decided to wallpaper. Oops. 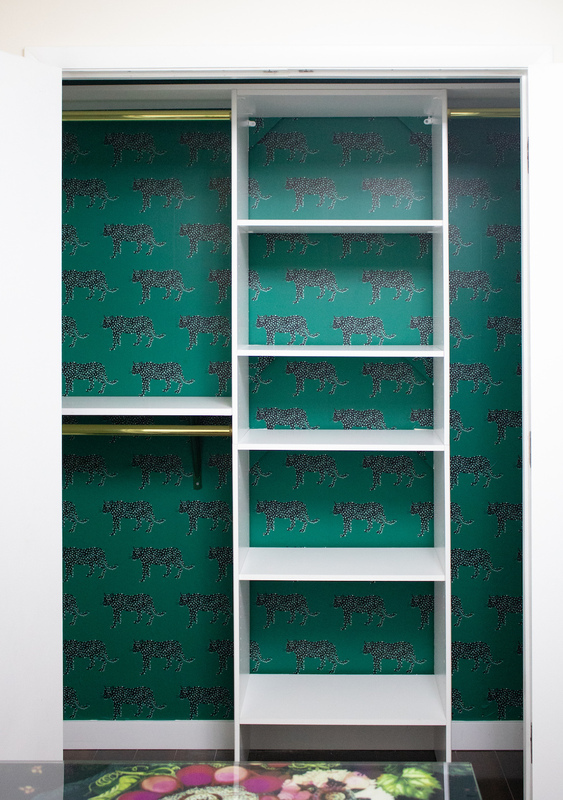 After we finished installing the unit, I started to brainstorm ideas to add a little pizazz to the closet and immediately thought of this panther print wallpaper from Target. I had previously come across it while shopping the Opalhouse collection for bedding for my bedroom makeover and knew it would be perfect. My closet is in my office and I wanted something that would play well off the Cynthia Rowley desk in the room. But because the unit was already secured to the wall*, I was worried about lining up the pattern and decided to keep looking. However, after over a week of searching day and night, I still couldn’t shake my draw to the print. So, I decided to go for it. *I ended up partially removing the 4 screws securing the unit to the wall and pulling it out just enough to wallpaper behind it. That made the process a breeze and I was done in less than an hour! I could stare at this wallpaper all day! I mean, it’s so good! I also had the shelf above the bottom rod*. 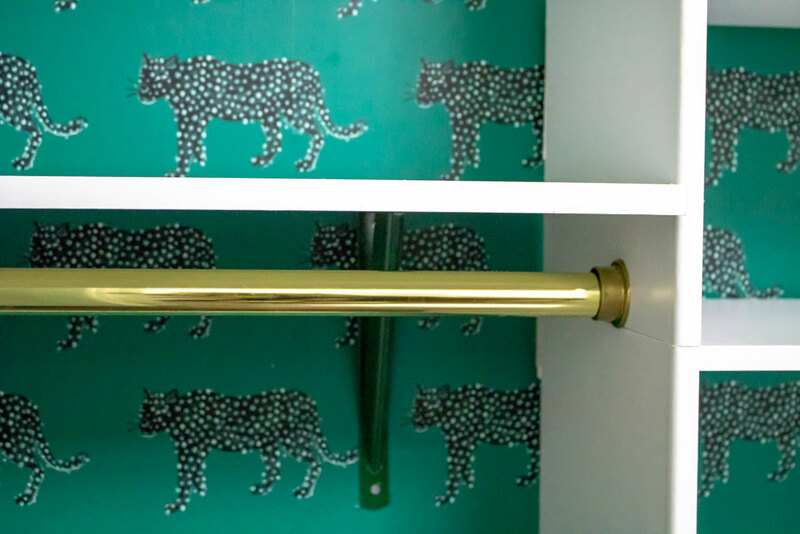 It’s supported by a shelf bracket that I spray painted green (I happened to have a can left over from another project) so it blended in with the wallpaper. *The long top shelf above the unit is the same shelf I added when I moved in last year. Once the shelf was installed it was time to, first, finish packing away the last few winter items I left out and then place everything back in the closet. I also added a few hooks on the walls—out of sight—to hang things. I’m currently using them as a place to hang my lighting equipment. Bash supervised the entire project. One of the great things about this makeover is everything is easily undoable. 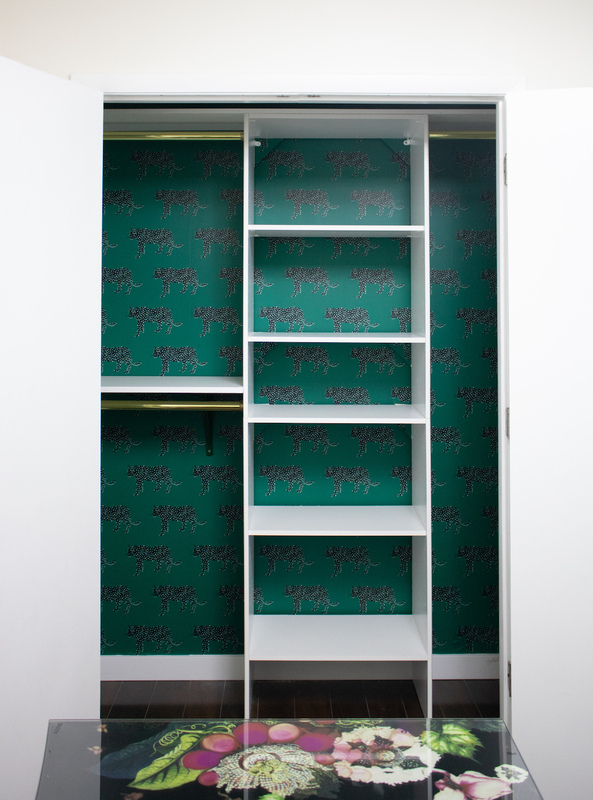 The closet system simply detaches from the wall (leaving behind only 4 small, easy to patch screw holes) and the wallpaper peels off with no damage to the wall and can be reapplied up to 99 times. Perfect for renters! But the BEST news is that the entire project cost me less than $300! I’m incredibly happy with the final makeover! I’m even happier to finally be able to see the floor in my office and officially have a place for everything. 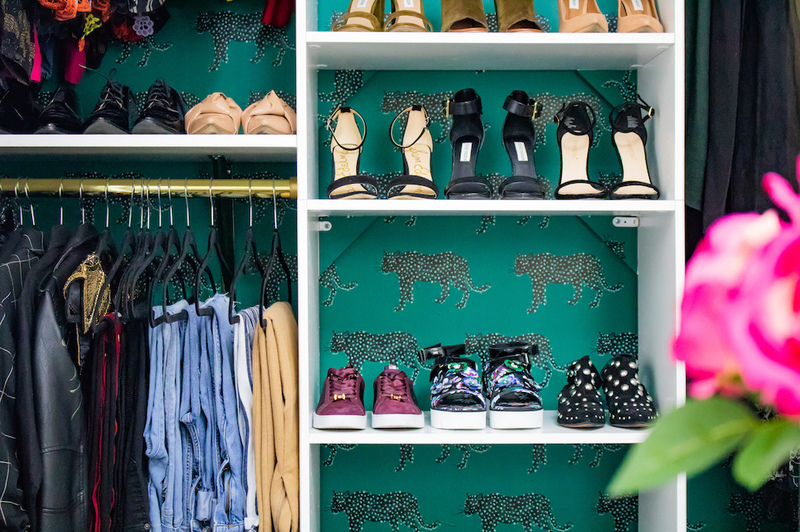 This gives me so many ideas for thinking about how to make a closet functional when I move. My closet is a walk-in now, but I have a feeling i’ll be down sizing once I move. This gives me a solution to the issues I was facing house hunting! I used 2 full rolls. Sometimes a little vision and drive is all we need. You’re amazing! I love it. 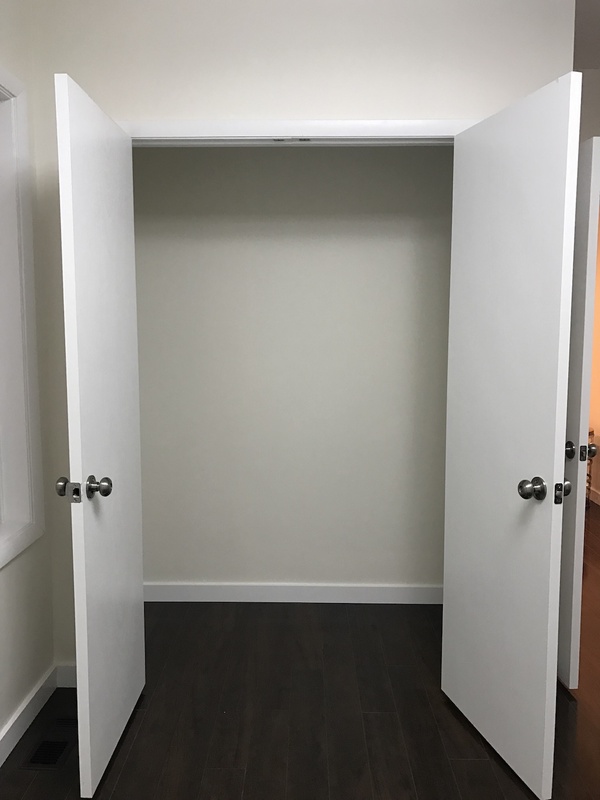 Now I’m going to look at my closets to imagine what they could be if I installed something similar.